The Gloucestershire Old Spots Pig Breeders’ Club pulled out all the stops to celebrate the remarkable achievement of 100 years of pedigree GOS pigs. That the breed teetered on the edge of extinction on a number of occasions means that this is a real milestone and we very much hope that someone in 2113 will be raising a similar fanfare in celebration of the breed’s first 200 years! 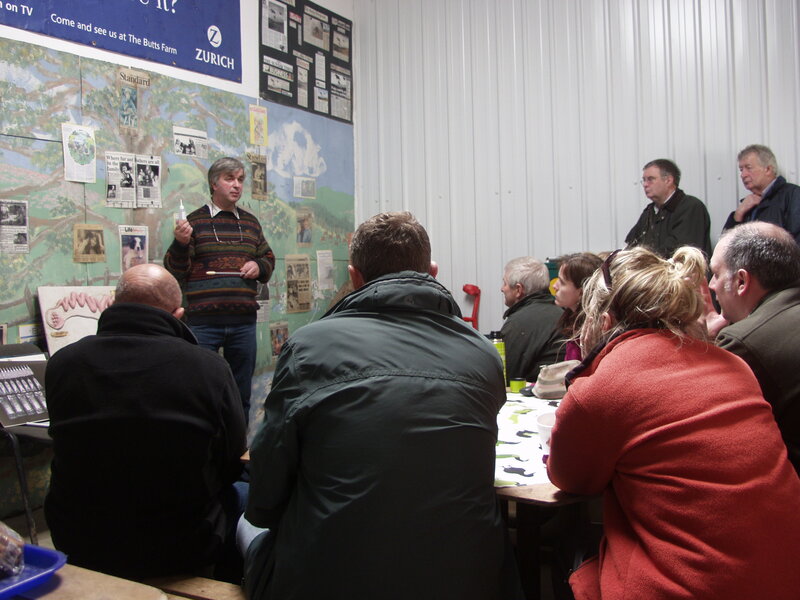 Running from February to September (with a break in June while the exhibition moved to the Royal Three Counties Show) the display was open to members of the public and inludes a number of items, photos and stories relating to GOS pigs over the last 100 years. 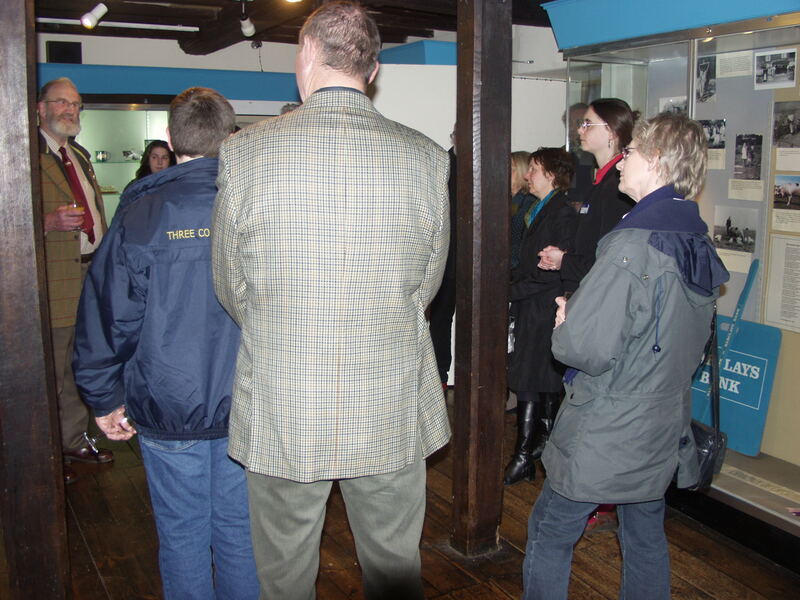 Former Committee member and local historian, Eric Freeman (left), welcomes delegates to the press reception at the Gloucester Folk Museum on 7th March. The GOSPBC’s AGM was held this year at Colesbourne Manor, near Cheltenham at the kind invitation of Sir Henry & Lady Elwes. 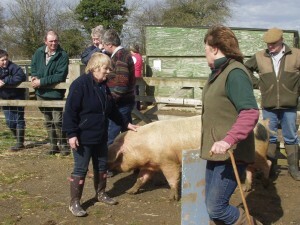 Sir Henry is grandson of Colonel Elwes who kept the Colesbourne herd of GOS pigs and who was Chairman of the GOS Breed Society (and who was noted for running meetings ‘with military aplomb’. The Elwes Memorial Cup awarded annually to the GOS Champion of Champions at the Royal Three Counties Show. 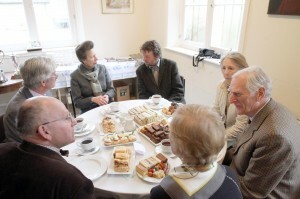 The event was for paid-up members of the GOSPBC and their family guests only. 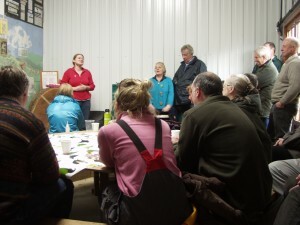 The AGM took place in the morning and was followed by a ploughman’s lunch. Sir Henry then conducted a tour of the arbortum and grounds before returning to greet the arrival of the Club’s Patron, HRH The Princess Royal. 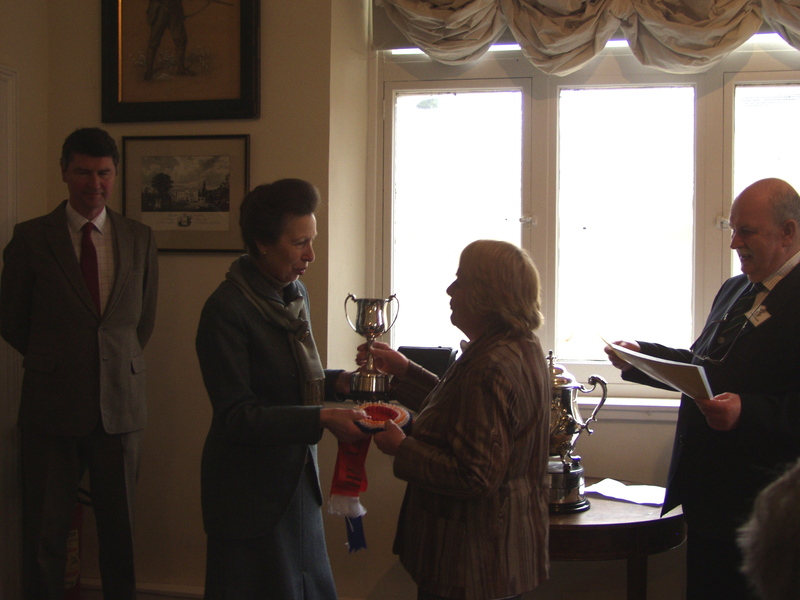 There was a Grand Afternoon Tea during which the Princess presented trophies and prizes for Club competitions including the Elwes Memorial Cup. 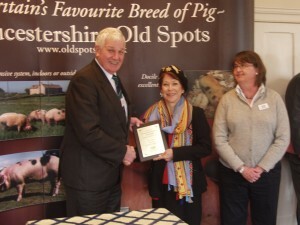 GOSPBC President, Dave Overton receives a commemorative plaque from GOSA President, Robyn Metcalfe and Vice-President Sally Doherty (right). 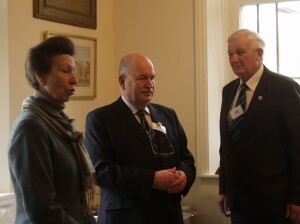 HRH The Princess Royal addresses members flanked by Club Secretary, Richard Lutwyche and President, Dave Overton. Vice-Admiral Sir Tim Laurence talking to our guests from GOS of America. 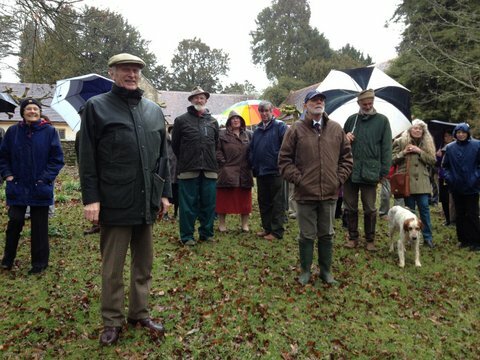 Our host, Sir Henry Elwes (foreground), shows delegates around the arboretum at Colesbourne Park. Judith Sims shows off the points to look for when selecting pedigree stock. Guy Kiddy gives an interesting talk on how to manage AI successfully. 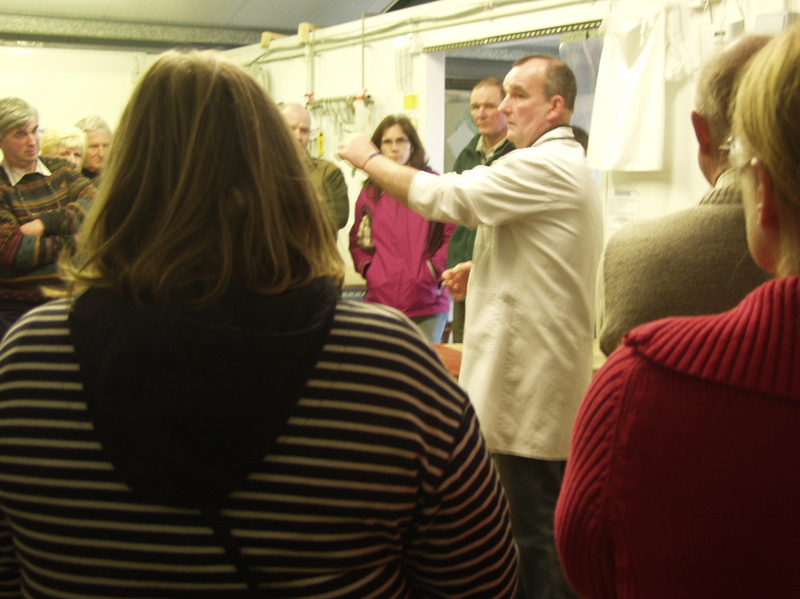 Gary Wallace talks to delegates on the importance of a quality carcase. 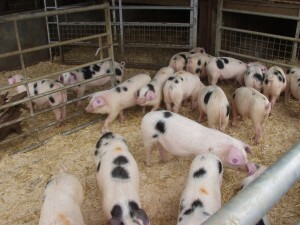 Some of the 100+ finishing pigs on view at The Butts Farm. 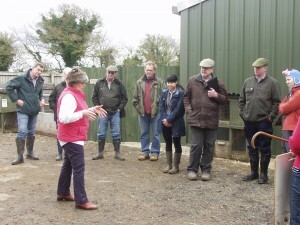 Mandy Garbutt explains the ins and outs of enjoying your showing experiences. 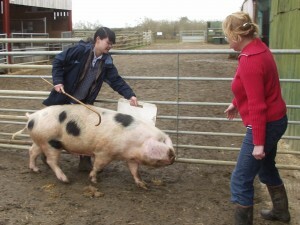 Marlene Renshaw explains what the judge is looking for in a show pig. 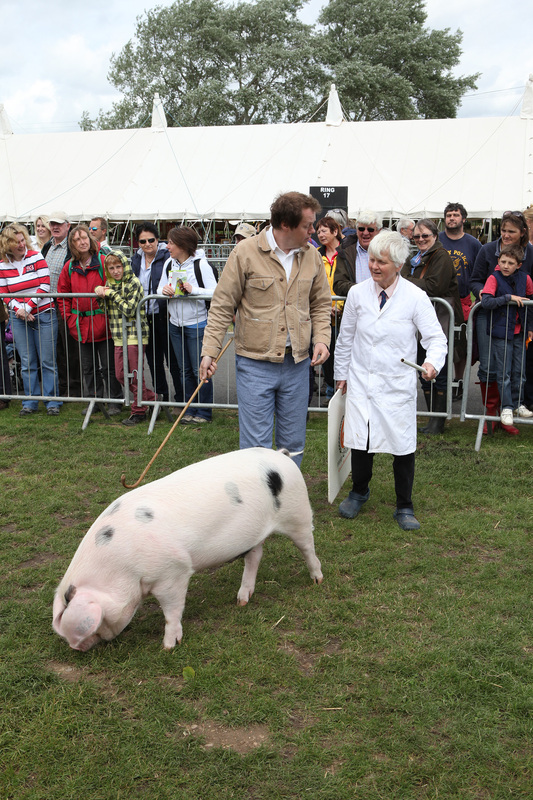 Alice Herbert has a go at walking a pig. 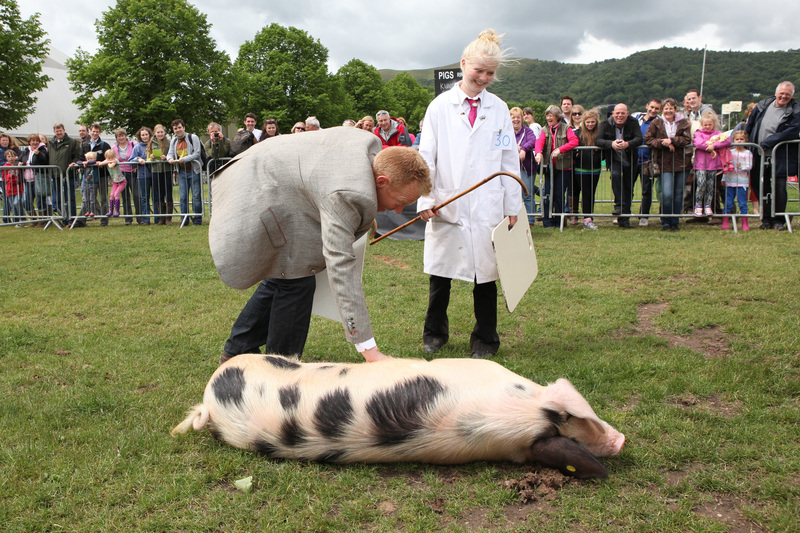 Much of the celebration was conducted at the annual Royal Three Counties Show at Malvern in June. Special classes were put on to encourage more exhibitors with the best turnout seen at a show for decades. 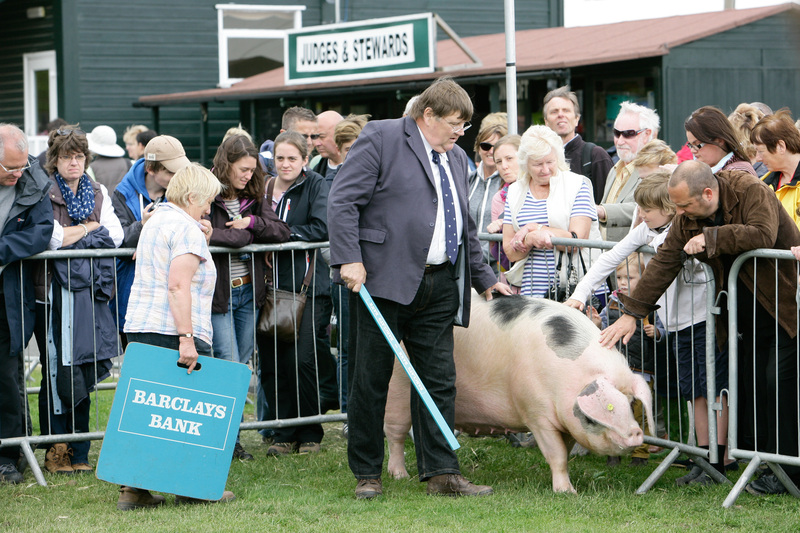 There was a Young sow class and a special competition for novice exhibitors never having won a 1st prize at a BPA Approved Show. The GOSPBC made a special one-off prize for the Breed Champion of£100 with £50 for the Reserve. Judith Sims was judge. Alongside the pig lines there was a tented display to celebrate the centenary including much of the exhibition from the Gloucester Folk Museum, open for all three days to the public. On the evening of Friday 14th June, there was a Hog Roast and Music celebration in the Members’ Pavilion open to everyone by pre-purchased ticket. 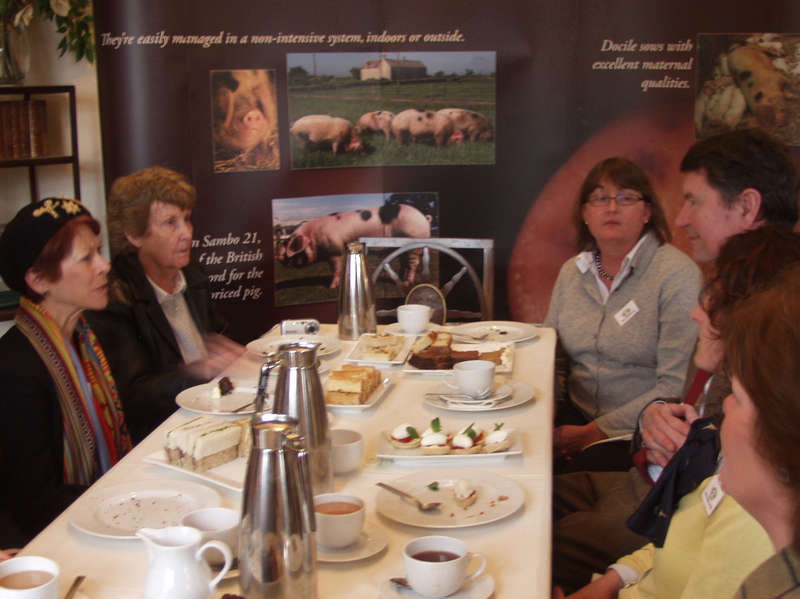 It was held jointly with the Rare Breeds Survival Trust who celebrated their 40th anniversary at the same time. 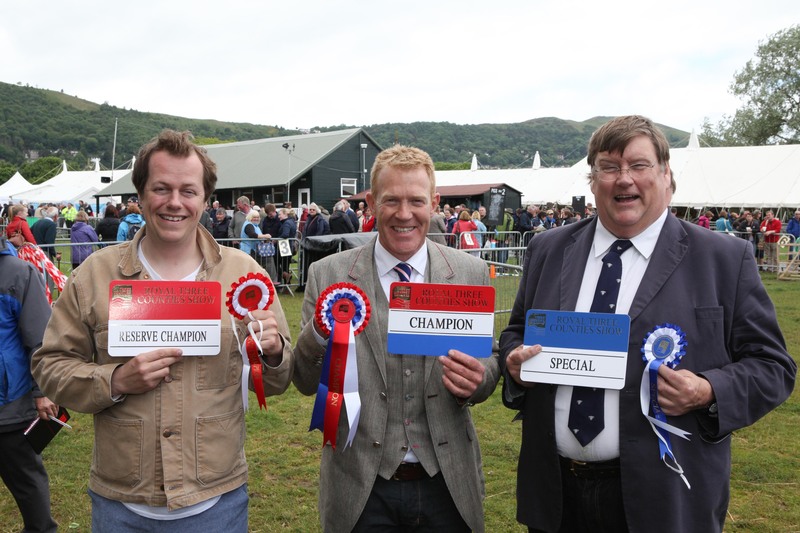 On the morning of Saturday 15th June, the annual Champion of Champions competition took place with the top pigs from the leading shows in the country competing for the main prize judged by Mrs Viki Mills & Mr Stephen Booth. 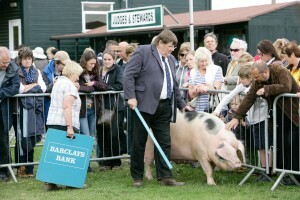 After due deliberation, Mrs Mills awarded the accolade to Pebblesford Sambo 411, a September-born boar shown by Kilcot Pedigree Pigs from Ross-on-Wye and bred by Mr John Lightfoot from Hartpury, Gloucestershire. 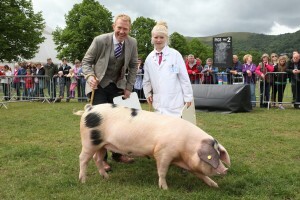 The runner-up was Birchfield Rufus 216, another boar shown and bred by Miss Sarah Whitley from North Yorkshire. In the afternoon of Saturday 15th June, the Club worked with the organisers of the show to stage an Old Spots Celebrity Challenge when celebrities including Countryfile presenter, Adam Henson, food writer and restaurant critic, Charles Campion and another foodie specialist, Tom Parker-Bowles, were all challenged to conduct a GOS pig around a porcine obstacle course. 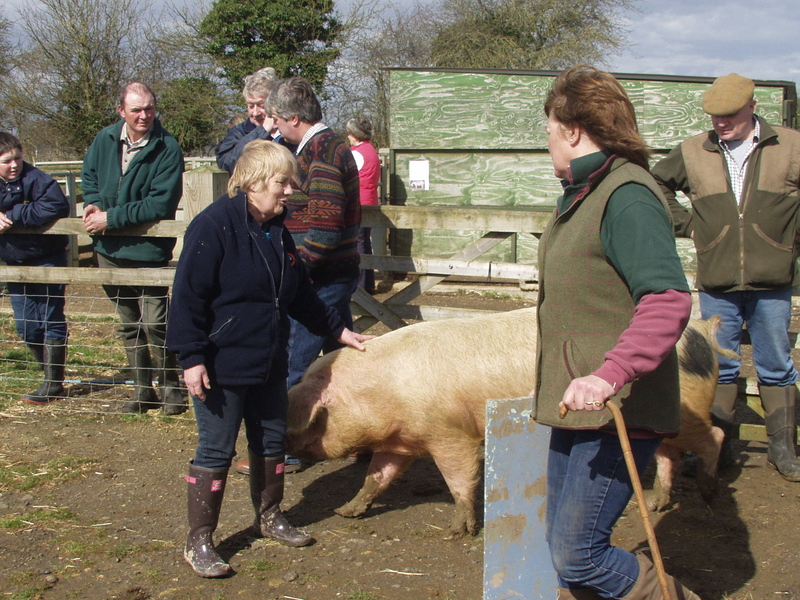 Restaurant critic and food writer (and a regular on BBC’s Masterchef) Charles Campion and his Winterwood pig and mentor, Judith Sims. To help to fund all these activities, the Club is organised a Grand Draw with a splendid selection of prizes donated by members. The draw took place on September 7th 2013. 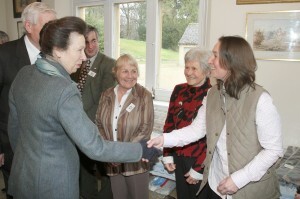 See http://www.gospbc.co.uk/grand-centenary-draw/ for winners details. To help increase awareness of our favourite breed, the Club is enjoyed a higher public profile to celebrate the centenary. There was a 2 hour programme hosted by Vernon Harwood in February on BBC Radio Gloucestershire. Also in February, a full page article appeared in The Ark, the journal of the RBST and a two page spread featured in Practical Pigs magazine. 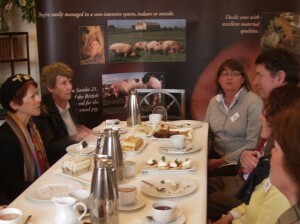 There was also photo montage of our AGM & Grand Afternoon Tea in a Cotswold Life Magazine. At all the major shows this year there were banners proclaiming 100 Years of Porcine Perfection! 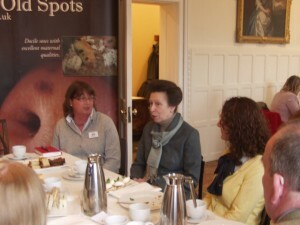 and displays. 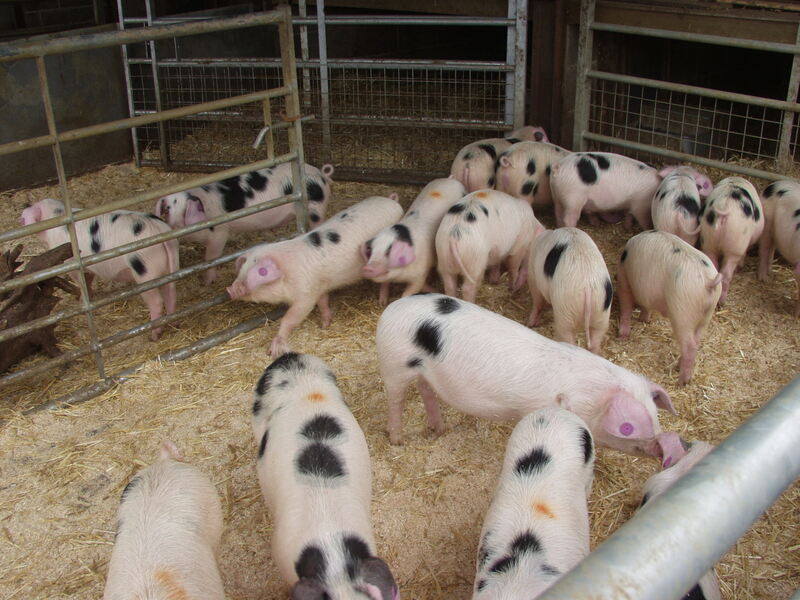 All this has helped to raise the profile of the GOS pig breed and reignite demand for breeding pigs, finishing stock and meat from pedigree GOS pigs.